Exclusive Custom Suzuki Skywave 125 cc Modified engine (piston, transmission rollers, coil springs) and new muffler for faster acceleration. 21,000km mileage, once in a month changing the oil, once in 2 month- clean the engine at the Suzuki service center and special racer service. Modifikasi total dan dirawat dengan ganti oli sebulan sekali, mantap. 2 bulan sekali mesin dibersihkan, weh perhatian sekali. Mat chocolate color and custom made fiber glass body moldings 85% of all body. Kitaco break system ( KTC and Youshumura disk breaks, KTC break handles, YSS shock absorbers, and KTC break oil tanks with hoses). Body kustom dengan rem yang sudah dimodif dengan barang bermerk, weh weh weh..
JBL sound system including 2 twitters and 2 buffers and JBL amplifier, its so louded, everyone will hear your music, its connecting to your phone or player. Full Music, hehe awam masalah sound system, cuma heran apakah speakernya tahan air? Koso electronic dashboard with BRT engine control. Most of the bolts changed to the stainles + special star aluminium cover . Wheels- 90/80 14 radius wheels exclusive. KTC Transformer hand bars- you can fix how do you want, any possitons is possible. Panel sudah full digital coy..
From the original scooter is only machine, most of the parts changed to the better one, thats why the price is like that. I always care about that scooter as baby, all the documents is for my name, first hand. Wah motor apa iniiii, asiiing kecuali kompartemen bawah stang itu sama panel tombol di stang yang masih asli Skywave. Kok mirip matc sebelah ya buntunya.. Mufflernya Mschine gun gaees, nembak dong..
Lampu sepertinya asli SW tapi karena detail body kustomnya malah mirip matic tetangga. 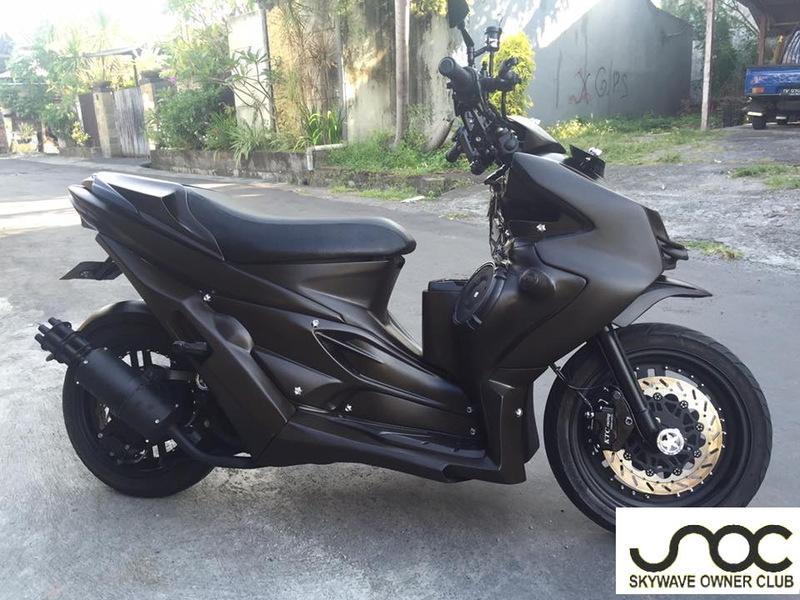 Skywave Dengan Batok Arashi, Cakep Pakde!